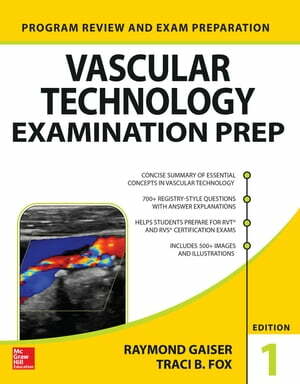 Collins Booksellers - Vascular Technology Examination PREP by Ray Gaiser & Traci B. Fox, 9780071829724. Buy this book online. Vascular Technology Examination PREPis packed with everything you need to know to ace the ARDMS® Vascular Technology registry exam. Covering all aspects of vascular disease and testing, this unparalleled review book combines a rigorous grounding in vascular principles with high-yield review questions that boost comprehension and retention. Major sections of the book survey each vascular region, including cerebrovascular, venous, peripheral arterial, and abdominal/visceral, while every chapter contains a full list of questions with answers and explanations. To further reinforce core concepts, Vascular Technology Examination PREP features full color illustrations, tables, and sonographic images throughout every chapter. Also included is a chapter covering the latest perspectives in quality assurance, with detailed information on patient and practitioner safety guidelines. Whether you are a seasoned or beginning sonographer, you can count on this indispensable, all-in-one learning tool to help you thoroughly understand the role and specific duties of a vascular technologist—and gear up for success on exam day.